Hi friends! I hope you all had a lovely day! We are doing ok. Brady was able to go to school today and afterwards we had lunch with Brady's friend and his mom. It was a nice afternoon. Today I'm sharing a card I made for my friend Katie Renz. I'm not too happy with it so I might just make a new one instead. I made this with Paper Smooches Spiffy Scooters because Katie started riding motorcycles not too long ago and she told me she loves it. :D I don't have a motorcycle stamp so this is gonna have to do. I thought the flower looking sun would be clever but now I don't think so. Sigh... 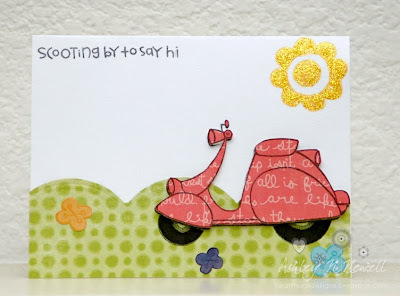 I was inspired for the colors of this card by the Paper Smooches Sparks challenge. I used Echo Park paper/stickers and Stickles on this card as well. And speaking of Katie, next Monday I will be participating in a blog hop to help raise money for Katie and her family as she's battling with gastric cancer. There will be a few special release stamps where all the proceeds will be going to the Renz Family. I will be hosting a challenge with a HUGE prize. Please join me Monday as I support my dear friend whom I love SO much as she so bravely fights this disease. If you'd like to donate now CLICK HERE. Your card is perfect! I am for sure going to hopping for Katie next week. Such an awesome take. Very cute elements, love your paper-piercings. Good-luck! !